Just slap me now and get it over with, because I’m going to complain about the weather. I know my readers in Ohio and other northern states are locked in the worst deep freeze in 20 years. I sympathize, honest. But on Sunday we endured some weather here in Florida that scared me out of my flip flops. Tony, I and the dog were already huddling in our camper with the heater on as temperatures began dropping to the 40s. 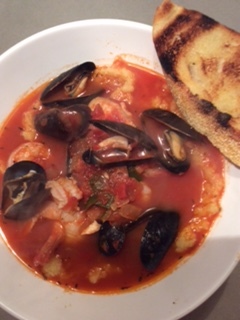 That was OK. We were prepared with wooly pullovers and a fabulously warming dinner of cioppino — a San Francisco seafood stew that I served over cheesy polenta, as I once enjoyed it at the Ritz Carlton in San Francisco. Dinner was great. What got us was the blasting rain and strong winds that buffeted our small camper trailer afterward. I finally crawled into bed with the dog and hid under the covers while Tony ran from window to window to see whether our awning had ripped off yet. I feared even worse after the tornado warnings a day earlier. We survived. I kept telling myself, “At least it’s not a blizzard.” Those who are enduring a blizzard can take comfort that at least you aren’t in North Dakota, where the temperatures have been in the minus whackadoodle range all winter. Except my friend, Tamila, who IS in North Dakota. I’m sorry, Tam. I made cioppino this week with my snow-bound friends in mind. It will really warm you up. I have always loved cioppino, but especially the one I had at the Ritz all those years ago. The great Gary Danko, chef there at the time, served it in a bowl over polenta, turning it into a lumberjack feast. I had Danko’s recipe at one time and lost it. I found it again online in time for Sunday’s cooking session. I made the polenta first in a slapdash way because I didn’t want to spend 20 minutes stirring. Instead, I sautéed onions and garlic in a skillet in butter, added wine and reduced it by half, and poured it all into a pan of chicken stock. Then I whisked in all of the polenta and stirred it over fairly high heat until it thickened, about 5 minutes. I covered the pot at that point and let it cook over low heat on its own for 15 minutes, stirring once or twice. Voila — perfectly delicious polenta. Of course, I enriched it with butter and grated Parmesan to amp up the flavor. Tony and I made quick work of the stew prep. He chopped the pepper, onions and garlic and helped me shell the shrimp and scrub the mussels. I put everything together with the crushed tomatoes, wine and seasonings, downsizing Danko’s recipe and changing some ingredients and methods to match my pantry and equipment. Steam fogged the windows and created a cozy atmosphere as we spooned polenta into big soup bowls and ladled in the seafood and soup. I served it with thick hunks of sourdough bread toasted on Tony’s tabletop grill. Life was good. Then the storm from hell hit. I hope this cioppino helps you through your own storm this week. Heat chicken broth in a small saucepan (2 quarts). Melt butter in a small skillet and sauté onion and garlic until limp. Add wine, increase heat and boil until wine is reduced by half. Pour wine mixture into saucepan with chicken broth. Whisk in salt and polenta. Cook over medium-high heat, whisking often, until it thickens. Reduce heat to low, cover and cook for about 15 minutes, stirring once or twice, until grains have softened. Beat in additional butter and Parmesan to taste — about 1 tablespoon butter and 1/4 cup grated Parmesan. Cover and set aside. Sauté the onion, garlic and green pepper in the olive oil in a soup pot until the onion is translucent. Stir in salt, pepper, pepper flakes and thyme. Add wine and boil for 1 minute. Stir in seafood stock and crushed tomatoes and simmer uncovered for about 20 minutes. Cut fish fillet in three pieces and gently lower into soup. Cover and simmer 5 minutes for a 1-inch-thick piece of fish. While fish cooks, begin to rewarm polenta over low heat. Add shrimp and mussels to the soup, cover and simmer just until mussels open, 2 to 3 minutes. Shrimp should be barely cooked through. They will finish cooking off the heat. Beat warmed polenta with a whisk or smooth out with a potato masher. Spoon into large shallow soup bowls. Ladle broth and seafood over polenta. Serve with sourdough bread. Makes 3 servings. Grilled beef ribs seasoned with chopped garlic; grilled strip steaks, fried beef and poblano peppers in olive oil, baked sweet potatoes; cioppino with shrimp, mussels and mahi-mahi over cheesy polenta. Grilled chicken and melted Swiss on a toasted bun at Old Dixie Cafe in Hobe Sound, Fla.; Smoked beef brisket, yellow rice and red beans, fried cabbage and onions, coleslaw from JR’s B-B-Q in Indiantown, Fla.; chicken stir fry, custard tart, marinated cucumbers, one bacon-wrapped shrimp, cantaloupe, grapes, and a sugared fried dough puff at King House Buffet in Okeechobee; scrambled eggs, bacon, half a pancake with strawberry jam and coffee at Glady’s in Okeechobee; a fabulous smoke-grilled 1/2 chicken, green beans with bacon and coleslaw at a festival in Moore Haven, Fla.; tortilla chips, green salsa, a pork tamale and a shredded beef burrito (bites of each; blah) at Monita’s Mexican Grill in Okeechobee. I made your Pork and White Bean Stew last weekend and it is another “Jane Snow Hall of Fame” recipe. It was paired with Southern Living’s Buttermilk Drop Biscuits (with whole grain mustard) for a great comfort food meal on a cold weekend. To post your recipe on my Pinterest board, I copied and pasted it from the newsletter email into a Publisher document, did a little graphics editing and saved it as a jpeg using the snip it tool. Easy to upload the jpeg to Pinterest. And thank you for the info on posting my recipes to Pinterest. Those who are computer-savvy enough to follow your instructions are encouraged to do so. Spread the word! I use gmail, and it is possible to highlight, copy and paste into a word document I just tried it again and it works, so no need to go to your blog site. Sorry for the bad info in last week’s newsletter. Thanks to you, I finally figured out how to highlight and paste from gmail on my MacBook. Thanks. For many years I have used anasazi beans in various stew recipes because I like the crispy/crunchy character of the beans even after soaking them overnight and cooking them. But I have had a hard time finding them in recent years. This year I ordered them online. However, when I cooked them I was very disappointed because they were mushy. Do you have any suggestions for a substitute for anasazi beans that have a crunchy texture after cooking? I think adzuki beans, which my husband buys in Asian stores, are firmer than most. Any other suggestions? 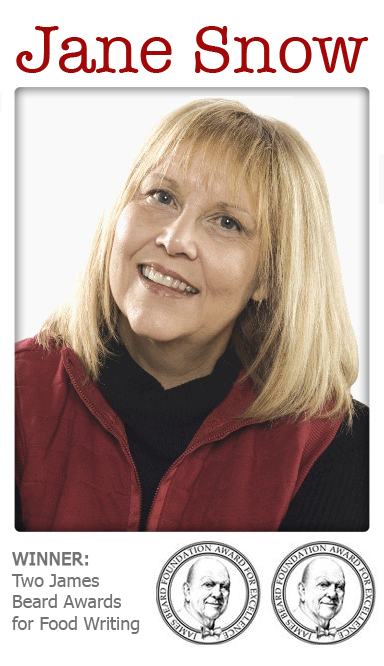 A portion of the proceeds generated through sponsorships of this newsletter go to the Jane Snow Fund For Hunger at Akron Community Foundation.